What it lacks in physical size, it makes up for in performance. While Tesla is working on solving range anxiety with its Supercharger stations, electric motorcycles and scooters continue to be tethered to outlets for hours in order to get back on the road. 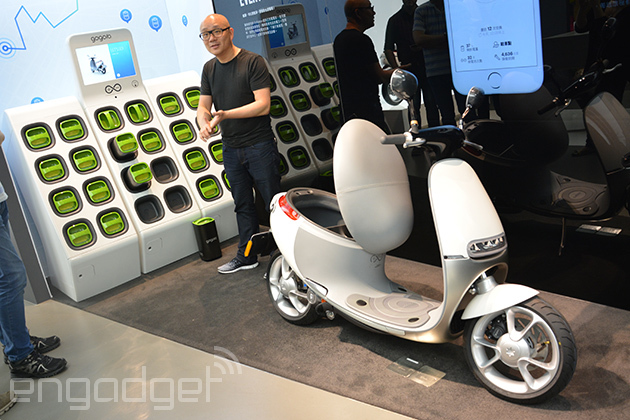 Smart scooter company Gogoro is trying to solve that problem with a network of battery-housing GoStations. Riders just pull up, swap out two batteries and ride away. The whole process should take less than a minute. It's an intriguing idea that requires partnerships with local governments and companies. But none of that matters if the scooter isn't at least on par with what's already available on the market. So we flew to Taipei and put the Gogoro smart scooter to the test. The tiny scooter was off the line slightly quicker than my larger Vespa. I crashed my first motorcycle (actually it was borrowed) at age five and I've been up on two (and sometimes three) wheels ever since. My current daily rider is a 2009 Vespa GTS 250 scooter. I zip to and from work and around San Francisco weaving in and out of traffic, and generally enjoying the fact that I don't get stuck in traffic plus I always have a parking spot. With that in mind, the Gogoro is an intriguing bike for someone like myself -- a city dweller that needs to get around with minimum fuss. 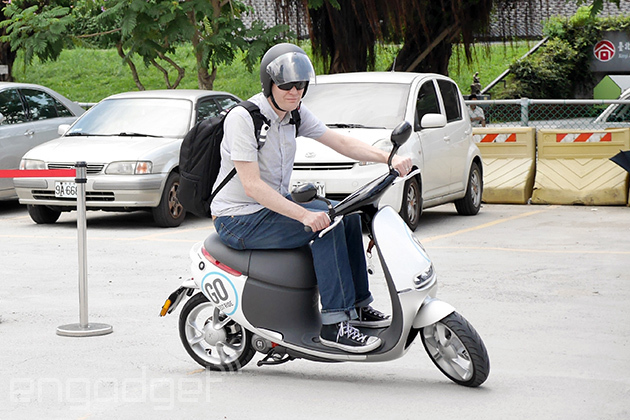 The smart scooter is the size of a typical 125cc scooter. Smaller than my usual ride. But what it lacks in physical size, it makes up for in performance. It's quick. I'm 200 pounds and I wore a 20 pound backpack to recreate the conditions of my daily commute. The tiny scooter was off the line slightly quicker than my larger Vespa and much quicker than the 200cc SYM I've ridden. If you're smaller than I am, you're definitely going to notice the difference between this bike and anything of comparable size. That size is one of the benefits of riding a scooter. The small tires and small frame lend themselves to tight turns and quick reactions to an ever changing environment. The Gogoro has both of those things, but its extremely rigid frame gives it a tighter feel. The stamped aluminum frame means less body flex while riding and therefore better handling. High speed turns, tight maneuvers and acceleration all felt snappier and therefore resulted in high lever of comfort knowing whatever move you made, the bike was right there with you. I've been on bikes from startups that seem to have forgotten how critical brakes are. While a majority of a bike's braking power is in the front, it's still important to have a rear brake that supplements that front brake in a meaningful way. It can be the difference between stopping behind a car and ramming into said car and spending the new few days in the hospital. The Gogoro brakes are solid, although I was disappointed to learn that the bike will not have an ABS (anti-lock brake) option. It's a smart scooter and nothing feels smarter than keeping the wheels from locking up in an emergency. Gogoro says that it's trying to appeal to a wider audience and that adding ABS would raise the price. It's a fair point. Most bikes with ABS are the higher end models of motorcycle marker's line. Of course, none of those high-end bikes have the smart capabilities of the Gogoro. The bike syncs with a companion app on Android or iOS and riders can adjust the brightness and color of the display, the light pattern and the volume of the horn (something you should turn up to 11). Because it's such a personalized experience, we didn't get a chance to really put the smart features through their paces beyond watching a demo at the flagship store. I do wish the display was a little brighter on the bike I was riding. Maybe the app will fix that. Another issue was the side mirrors. To adjust them you have to push on the mirror itself. The housing doesn't move, just the mirror. So after getting your mirrors positioned, you're looking at the the world behind you framed in fingerprints. 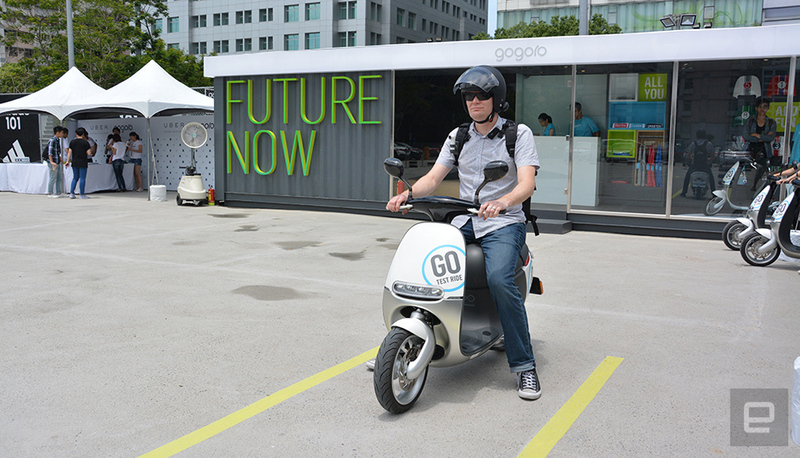 The Gogoro smart scooter is just the first step in the company's long term plans. Then there's the price. We don't know what it is. We don't even know when this scooter will launch. Plus, how will they charge riders at those battery stations? The company says all this will be announced soon with the bike going on sale this summer. 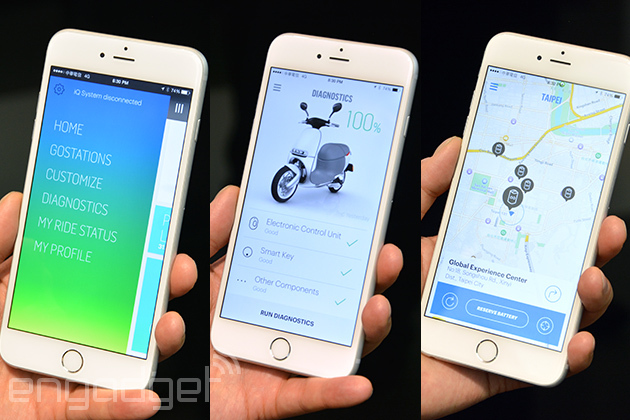 What we do know is that it'll launch in Taipei first. There's a lot of craftsmanship in this scooter. That attention to detail costs money and while there will be government subsidies to help offset the cost, don't be surprised if it lands somewhere between a mid-level and high-end scooter. But that's how technology works and the Gogoro smart scooter is just the first step in the company's long term plans. It's the proof of concept that shows the world that you can power vehicles and other devices with batteries without waiting hours for a recharge. It's a fun first step and I look forward to it hopefully landing in San Francisco. Video and photos by Richard Lai, Andy Yang and Ross Wang.